Welsh number one, and World No.33, Joel Makin will compete in the quarter-finals of a PSA World Tour Platinum event for the first time in his career tomorrow following his third round defeat of Frenchman Mathieu Castagnet at the 2018 Qatar Classic – a victory that comes just 24-hours after the 24-year-old shocked Colombian World No.6 Miguel Angel Rodriguez in the second round. The Pembrokeshire native, competing in the Doha-staged tournament for the first time in his career, has been in scintillating form so far this week and followed up his first round 78-minute defeat of Rex Hedrick, which preceded his 106-minute defeat of Rodriguez, with a 60-minute victory over Castagnet that saw the Frenchman concede through injury mid-way through the fourth game of their encounter. Makin had been in control of the match from the outset, showing impressive recovery and tenacity as he out-worked Castagnet during the first two games. The Frenchman found his range in the third to get a foothold on the scoreboard but pulled up at the mid-way point of the fourth game to hand Makin safe passage to his first ever major tournament quarter-final. “To reach the quarter-finals for the first time is massive achievement,” said Makin. “I hadn’t gotten past a first round before the start of the season so to see the hard work that’s been put in over the summer pray off so quickly is really pleasing. “Obviously it is massive to be there for the first time and I’m excited to be in the latter stages of one of the biggest tournaments on the calendar. “There’s been no secret change, it just feels like the accumulation of years of work coming together. I feel like I’ve been gradually increasing my level and because of that I’ve been able to impose my game and my physicality on court better so hopefully I can keep going that way. Makin will go up against 2017 tournament runner-up and World No.4 Tarek Momen for a place in the semi-finals after the Egyptian defeated former World No.1 James Willstrop while another former World No.1, Karim Abdel Gawad, the 2016 tournament winner, prevailed in a breath-taking clash with rising English star Declan James to keep his tournament alive. Gawad was pushed all the way by the World No.20 and was forced to come from behind, and withstand a huge last ditch barrage, in order to prevail and set up a last eight encounter with compatriot and World No.2 Ali Farag. 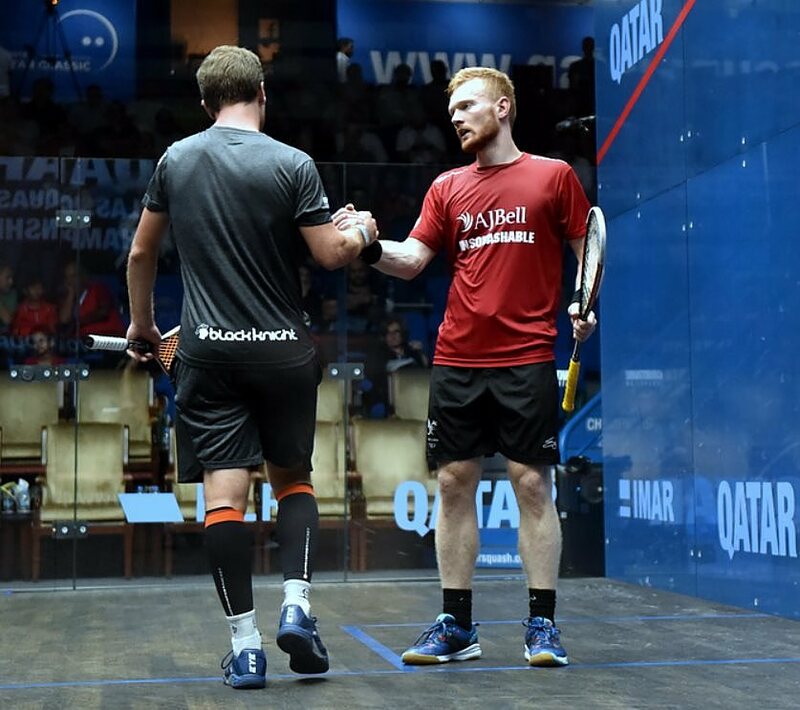 “Declan gave me a very hard time on there today – that was a very, very tough match,” said Gawad. Gawad will take on compatriot, and World No.2, Ali Farag with World No.1 Mohamed ElShorbagy set to face Peruvian former World Junior Champion Diego Elias in a compelling clash following their third round victories over Adrian Waller and Mazen Hesham, respectively. Lima-based Elias, the World No.13, was a quarter-finalist here last year and showed signs of returning to some of his best form as he swept aside Hesham – one of the most gifted players on the PSA World Tour – with ease, prevailing 11-7, 11-6, 11-5 in just 36-minutes. “The key today was the warm up – I had to be ready for him from the start because he’s the kind of player who can send you five directions in one rally,” said Elias. The other quarter-final will see Paul Coll of New Zealand face Germany’s Simon Rösner.